Leszek Balcerowicz, former President of the National Bank of Poland, was the architect of economic reforms. CNN's new series i-List takes you to a different country each month. In June, we visit Poland focusing on changes shaping the country's economy, culture and its social fabric. (CNN) -- While the rest of Europe has battled with recession, Poland remained the only country to keep its head above water. Its growth did slow to a crawl, but avoided full recession thanks to its very low private debt, robust domestic demand and flexible currency. Poland's economy grew by 1.7 percent last year, while all others in Europe except Malta shrank. The forecast for 2010 is two percent growth. Rafal Szajewski, Project Manager of the Polish Foreign Investment Agency, said: "Many of our neighbors suffered in the global downturn because they rely heavily on exports, but we have large demand from our domestic market. For many years, Poland didn't have a middle class, but in the last 10 years that has changed and there's a strong internal market." Szajewski said Poland's economy was shifting from manufacturing and now saw its future in services industries such as IT. Like most of the world, however, Poland is struggling against a budget deficit. Its deficit this year is expected to be seven percent of GDP and international credit agencies have warned its credit rating may suffer if it is not tackled. Many of our neighbors suffered because they rely heavily on exports, but we have a strong domestic market. Matteo Napolitano Senior Economist for Central and Eastern Europe at the Economist Intelligence Unit, said: "Although the budget deficit is not unduly high, there doesn't seem to be the impetus towards consolidation as there has been in other countries. "Possibly Poland's claim to fame as the only economy to grow last year has made policy-makers a bit complacent," he told CNN. Poland's policy of economic liberalization since 1990 allowed it to grow about five percent a year up to 2009, according to the CIA World Factbook, which describes the country as a "success story among the transition economies." The economy has been boosted by EU funds since its membership in 2004. However, unemployment is still above the European average at 11 percent and reducing unemployment is a key priority for economists. Leszek Balcerowicz, former President of the National Bank of Poland was the architect of Poland's deep economic reforms after the collapse of communism in 1989. 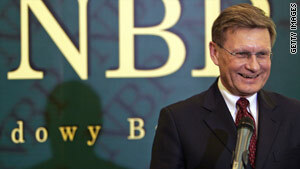 Balcerowicz, now Professor of Economics at Warsaw University, told CNN: "We need to look at win-win reforms. And win-win reforms are everything that raises the level of employment, including raising the retirement age." In the past years many such reforms fell victim to political infighting, and many economists see the upcoming second round of the presidential elections as crucial to breaking that logjam. Among Poland's thriving companies is Polpharma, the country's largest producer of pharmaceuticals, whose production lines are running close to full capacity. "We are investing into new technologies, into the people, into assets, just to introduce new products and launch in different countries," said Tomasz Moys, a director of Polpharma. Poland's economy could receive a big boost if reserves of shale gas are found in the north of the country. Exploration has just begun, but international companies believe there could be large reserves. Kamlesh Parmar, Country Manager for Lane Energy Poland, said: "We have a million acres in this part of the world and we hope that our testing will show that a lot of that is prospective."